I love discovering natural products. Especially during my pregnancy time, I kept using those products which were totally safe for my skin as well as for my babies. During the third trimester of my pregnancy I started to get those #NotSoPleasing stretch marks which tend to bother me. I searched for several solutions online – Most of the products suggested by experts either had mineral oil as an ingredient or weren’t suitable to be used during pregnancy time. That’s when I discovered this Indian house hold brand – Wild Organic Home. 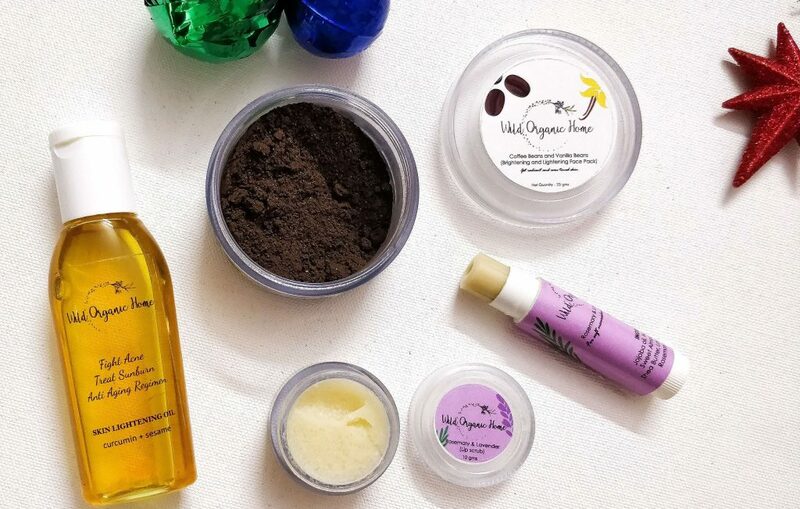 Wild Organic Home products are nothing fancy – Simple packaging using some of the powerful Indian Ayurvedic Ingredients. Now, that’s amazing right. I remember bathing using turmeric and milk ubtan during my childhood days. Those times were truly magical and a whole lot of fun with grandma grinding and making raw turmeric paste or dried turmeric powder and mixing it with several ingredients to make ubtans and medicinal pastes that worked wonders on the body. These days, anything and everything that claims to be natural is not so. They come with no ingredient list or partial list that can’t be trusted at all. 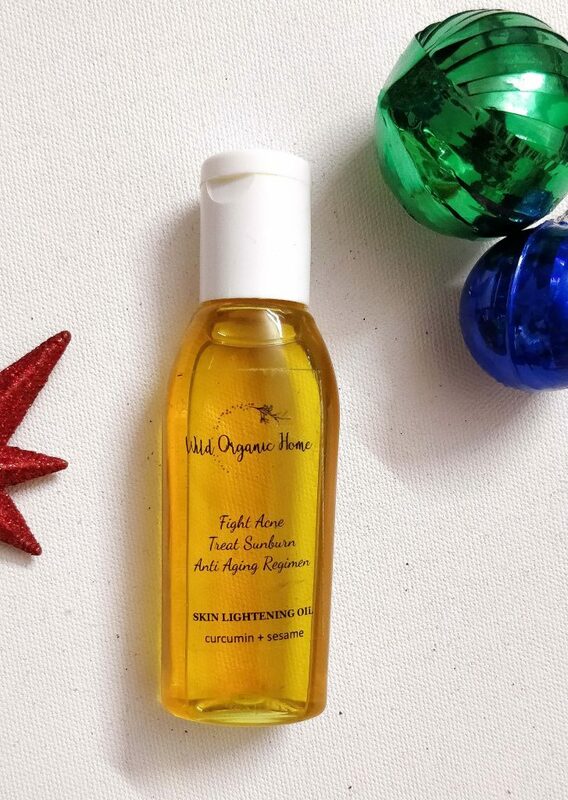 I discovered Wild Organic Home at a time when I had totally gave up on ‘natural’ claiming products. But, Somehow the minimal ingredient list and great reviews made me wanted to try them. It was during that time the lovely Founder, Evangelist contacted me to gift me few products from her product range. As I mentioned these products in the post are #gifted to me. But, my opinion is strongly my own experience of using the products. Before I start my review, Let me also remind you that natural ingredients – might not suit everyone. some of you might be allergic to certain ingredients. So, it’s always good to patch test and wait for 24 hours to see how your skin reacts to the product. Though the product title says skin lightening oil – My whole intention of using this oil was to lighten my stretch marks and I am not in favor of any products that claim to change your actual skin color. Every color is beautiful. Like I said earlier, I was ready to explore any natural oil to reduce my pregnancy stretch marks and few marks that I have on my leg area which is a result of ingrown hairs. I was in search of products with fewer ingredients and something which I’d use throughout my pregnancy. Turmeric root has been used since thousands of years ago and is highly valued for its powerful antioxidant, antiseptic and anti-inflammatory properties. In Ayurveda, this golden spice is referred to an all purpose cleaner because it purifies the body internally and externally. Sesame oil is rich in antioxidants and is easily absorbed in the skin. It is great to see a good improvement on the scars on my body. It almost got rid of my in grown hair marks on legs. And my pregnancy stretch marks seems to be fading fast too, Let’s be real – nothing can completely reduce the pregnancy stretch marks. However, you can lighten the scars and improve the elasticity of the area thereby nourishing and hydrating the area. You can start using this oil in your 5th or 6th month and that way it treats skin better. I feel if used from the start, It’d improve the overall skin elasticity during pregnancy time where the skin tend to stretch so much. Curcumin & hydrating Sesame Oil combination helps repair skin, reduce uneven skin tone (If you have a normal skin – You can use it on face and give it a good massage and wash off using a ubtan or mild cleanser); If you are looking for a 100% natural skin brightening massage oil with minimal ingredients for lightening marks, treating pigmentation, blemishes, dark spots, uneven skin tone and preventing early skin ageing – this oil is perfect for you. curcumin – a powerful antioxidant for skin brightening and repairing is comined with moisturising Sesame Oil which is the hydrating and nourishing base. I highly recommend this if you are looking for a natural body and face oil to reduce scars !! 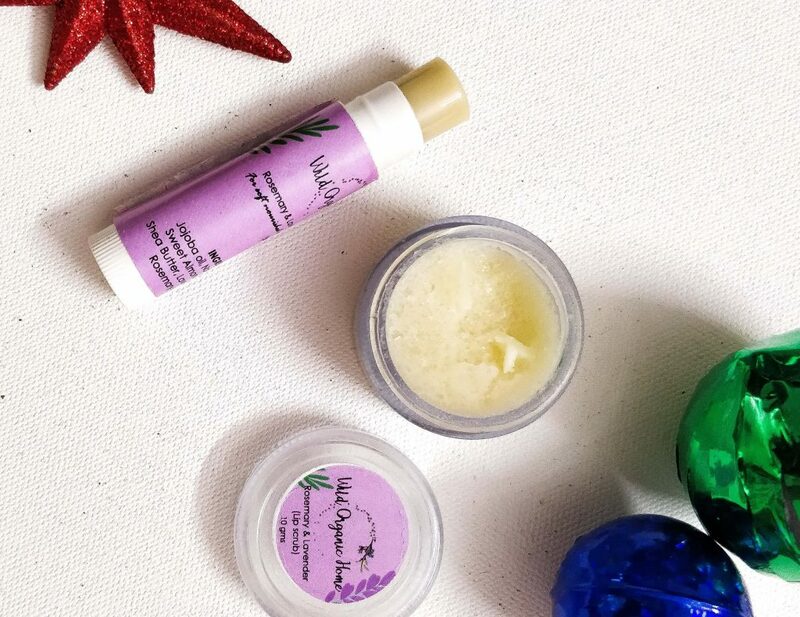 The soothing Rosemary & Lavender Lip Balm provides lasting moisture to your lips. The refreshing rosemary and calming lavender essential oils with hydrating and nourishing beeswax and shea butter formula is perfect to protect your lips all day long. Use it regularly to keep your lips nourished. I love the natural fragrance of this lip balm. Take a small scoop in your hand and scrub gently on your lips using your fingers or a baby tooth brush to scrub away the dead skin cells. wipe of using a warm wet cloth and apply the hydrating lip balm. This scrub moisturize your lips while exfoliating away the dead cells, leaving your lips wonderfully hydrated and healthy. Use it every week twice. It’s a good solution for dry, chapped lips. The calming lavender and rosemary fragrance is a big plus for me. I love to pamper my skin using natural face packs. You may mix one teaspoon of this mask along with water (Normal Skin) [Oily skin – Rice Water & Dry Skin – milk] to make a paste. Mix and make the paste as per your skin type paste and apply it on already cleansed face. Apply the face mask and let it rest for about 15-20 minutes or until dried. Rinse it off with cold water while massaging gently for 1-2 minutes to exfoliate any dead skin cells from the face. Repeat it for 2-3 times in a week. The mixture of coffee and vanilla will leave your skin clear from impurities and dead skin cells and makes skin soft and smooth. It will also calm your skin’s redness and reduce inflammation of the skin. You can also apply it as an eye mask for puffy eyes. 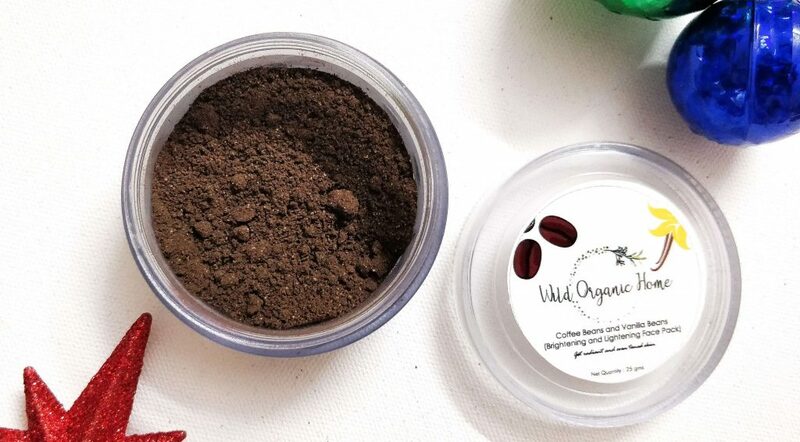 Wild Organic Home Coffee Beans & Vanilla Beans Face Pack detoxify skin, reduce redness on your skin, remove sun tan and tighten skin. You’d see a good difference on your skin if used regularly. This beautiful mask smells awesome too. Roasted Coffee ground and Vanilla fragrance is relaxing! Overall, Wild Organic Home products are wonderful with minimal ingredients. No artificial color or preservatives, cruelty free, freshly homemade in small batches to ensure quality. Availability – You can order these products from Wild Organic Home Facebook Page.